Who is this man? 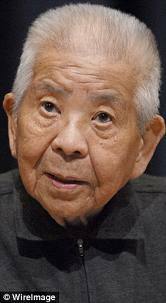 His name is Tsutomu Yamaguchi, and he died in January of 2010 at the ripened age of 93. Why is he so historically interesting? Well, in August of 1945, he was an employee of Mitsubishi. He had just finished work when an American bomber dropped a special bit of ordinance on his city. That city was Hiroshima. And the ordinance, of course, was the world’s first atomic bomb. Amazingly, Tsutomu survived that horrific attack. Still more amazing, the trains were still running! I’ve always been impressed by the efficiency and punctuality of Japanese transit, but to continue running in the face of atomic war is on another level entirely. Tsutomu managed to get himself onto a train heading to his hometown. That town? Nagasaki. Yes, you guessed it. Tsutomu was present when the second atomic bomb hit that place, as well. Apparently, several scores of people were present for both explosions. But Tsutomu was the only one to have been within the 2 mile blast zone of both devices. The luckiest man in the world, or the unluckiest? Tsutomu lived to be 93, finally succumbing to cancer-related ailments later in life. His wife, too, survived into the 21st century, but also dying of cancer. His son died of cancer many decades ago. But he has two surviving children. What can be learned, health-wise, from Tsutomu’s experience is unclear. But his is definitely an amazing story.